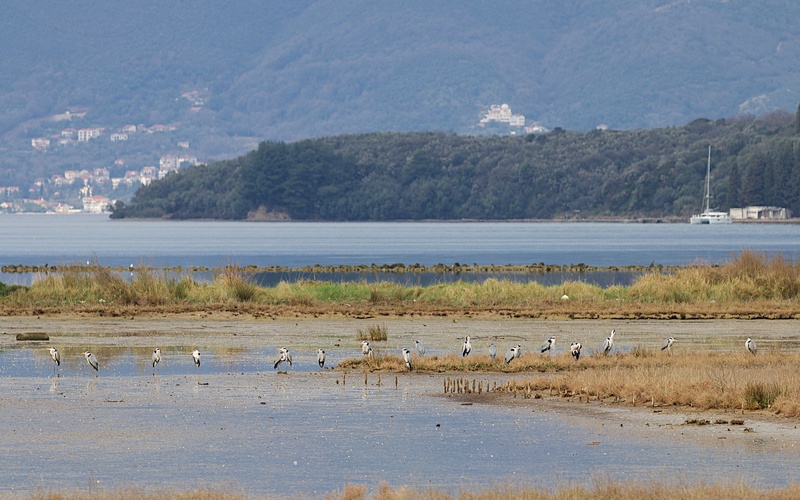 Tivat Saltpans (Tivatska Solilas) is an area of intertidal habitats and former saltpans within the Bay of Kotor protected in 2008 as a 150 ha. natural heritage site. In the language of protected areas, ‘potentially damaging operations’ are not permitted. In a country where hunting and fishing is so prevalent, this is great news for the wildlife. The site was of economic and strategic importance in Renaissance times when salt was a high value commodity. Once a shallow, isosceles triangle of a bay between the Tivat and Lustica peninsulas, a stone dam was built at the valley’s narrowest points and the water levels managed within a matrix of shallow, rectangular lagoons for the production of salt by evaporation. 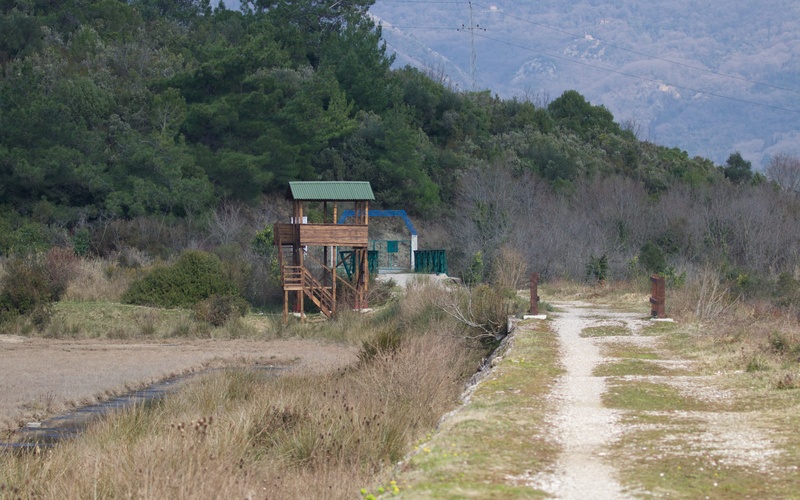 The access into the reserve is from either end of the dam but there is a signposted lay-by on the Lustica road. The principal route through the reserve runs atop this dam with two wooden birdwatching towers at each end. The views from the dam are wonderful but, unsurprisingly the birds keep a safe distance away. Lovćen mountain is to the north and the much larger Orjen massif, beyond one wing of the Bay of Kotor, to the west. The walkway along the top of the dam with observation tower at the end. Seaward of the dam is saltmarsh, mudflat and low islands. 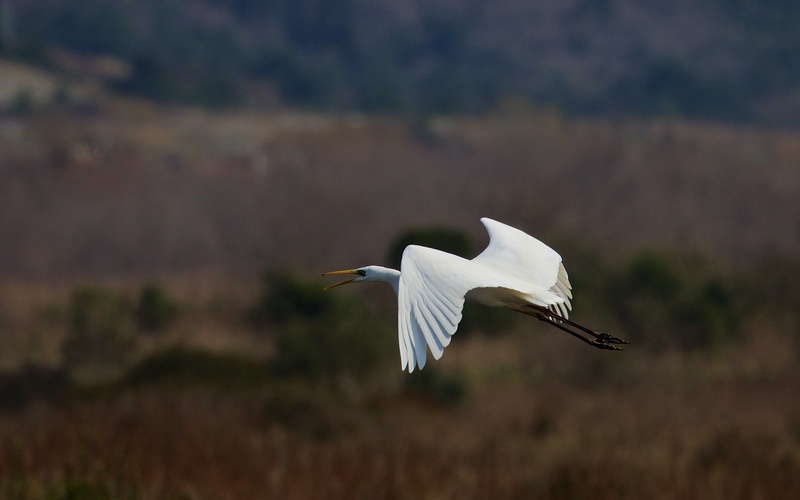 Saltmarsh is, so the useful educational signs say, an extremely rare habitat in the Adriatic. The old saltpans are landward, now filled with patches of shallow open water but, predominantly, stands of sedge, soft rush and reed with wet pasture, reedbed, scrub and wet woodland further inland. The flow of water is complex: I think a large central channel runs seawater up the valley and streams or dykes run freshwater down the edge of the valley sides. Seawater would have been tapped off the central channel to fill the pans. Today, the water in the landward side is, in the absence of maintenance and management, probably brackish but with varying levels of salinity and hence supporting a complex range of plants adapted to the dynamic conditions. Each day a farmer escorts his cows to the wet meadows with much whistling and bellowing; being selective grazers the cows help to keep the vegetation in check and the tussocky sward they create is preferred by breeding waders like snipe and redshank. The reserve looks like it is doing a good job at protecting and managing the mosaic of habitats. 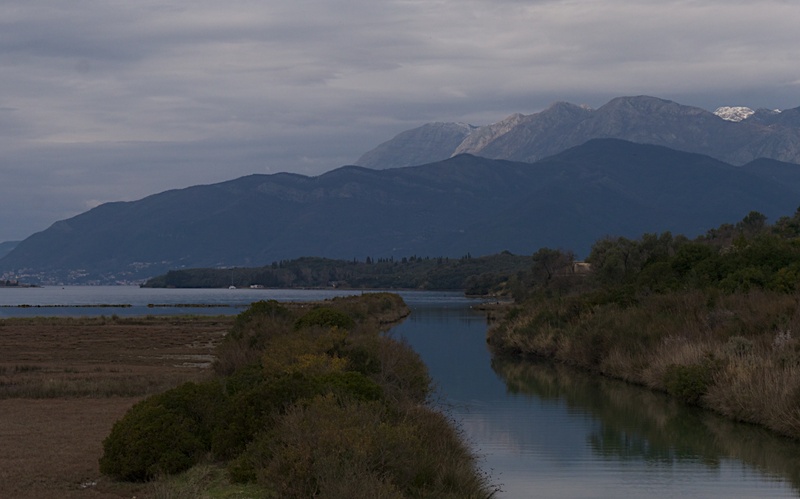 The view landward of the dam; the central drainage channel with old saltpans to the right and wet meadows and woodland to the left and Lovćen mountain beyond. Access by people is limited to the dam, which is frequented by dog walkers, joggers and those just out for a stroll, and the first inner bund (small earthen dam). However, a man was building a wooden bridge over a dyke, which will make it possible to walk much further inland along the edge of the central channel. Looking seaward towards Orjen mountain. 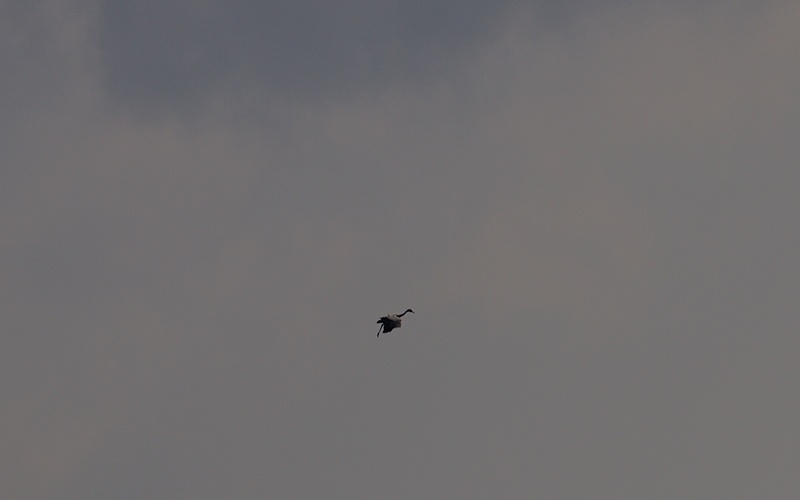 My first visit on 12th March recorded no spring migrants with the notable exception of the loud arrival of three common cranes, circling down from the south west and disappearing into the pastures. Local birds included a large siege of herons on the seaward side of the dam. These stood hunched up in a neat line; clearly the conversation, as always about fishing, was tedious. Grey heron siege on the mudflats and one of three common cranes coming down to land. Great white egrets, black-headed gulls and a small number of waders; curlew, redshank and dunlin were also on the mudflats. Within the fields and marshes, a small number of little egret, ruff and black-tailed godwit. Buzzard, a persistently circling European sparrowhawk and a ringtail (female or first year) hen harrier livened the reserve. 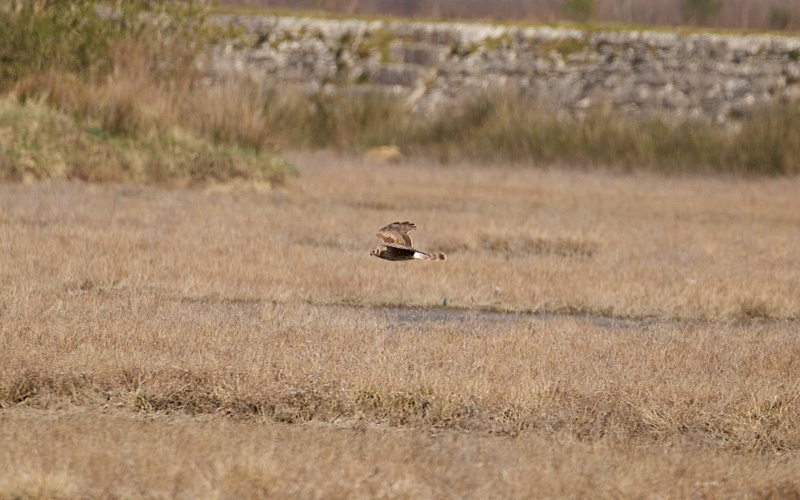 Ringtail hen harrier hunting the saltmarh and great white egret. On the 23rd March, the same herons and egrets together with a shelduck we’re on the mudflats. 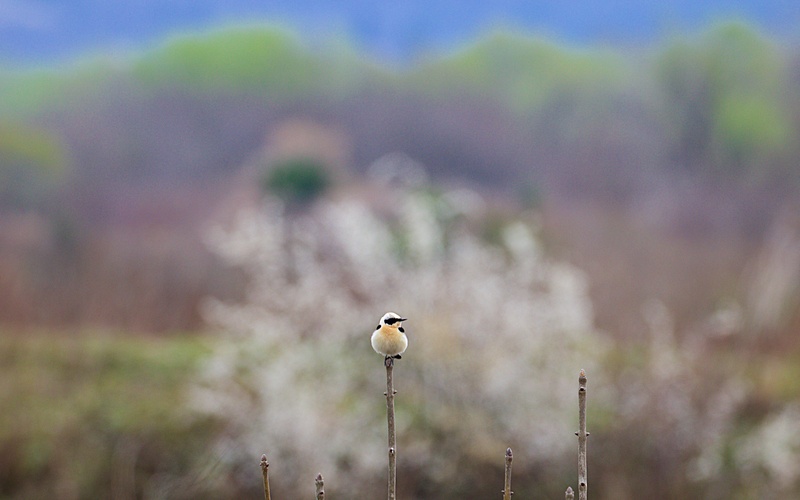 Small parties of swallows and house martins together with single European and black-eared wheatears indicated that spring migration was starting. Stunning yellow wagtails fed and flew over along with skylarks and pipits. Stonechats were ever present and water rail was heard. 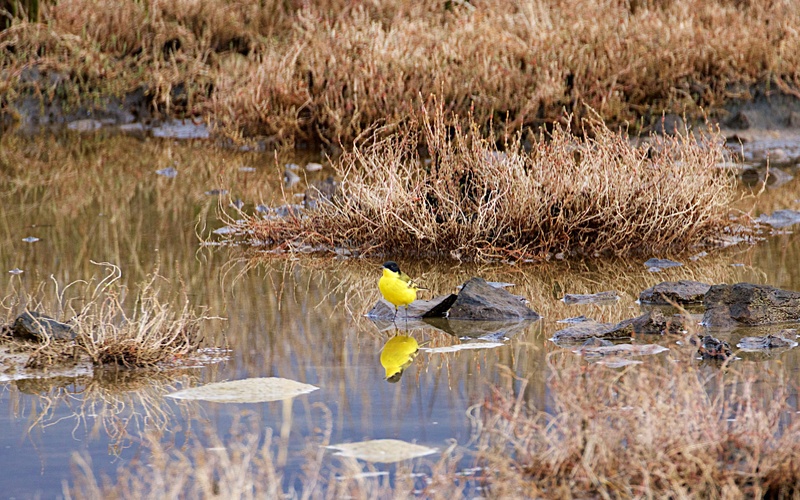 Black-eared wheatear and yellow wagtail (the striking feldegg sub-species). This is an easy site to watch but would probably be better for the birds (and birdwatchers) if people were routed off the skyline of the dam. I alone disturbed at least one heron, two great white egrets, three or four little egrets, four teal, two mallard and three green sandpipers on my visits. If one estimates (there is a vast literature on the issue) that waterbirds do not come within 100m-150m of the dam because they are regularly disturbed by people then at least 10% of the reserve is effectively not available for foraging or roosting. A path in the lee of the landward side of the dam with birdwatching hides on top might work. Leisure walks may be less enjoyable but one of the key features for which the site has been protected, the birds, would benefit and more birdwatchers would probably visit. Easy to say but almost certainly quite hard and expensive to implement. Nature reserve management for wildlife and people is often surprisingly complicated.